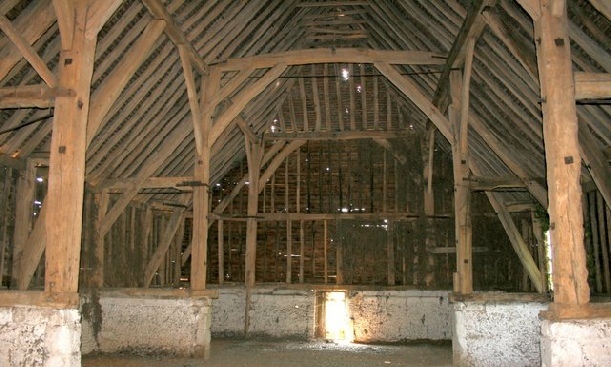 Croxley Great Barn, near Rickmansworth, is one of the surviving barns originally built for to St. Alban’s Abbey towards the end of the thirteenth century. The barn has a number of unusual features including sling-braces (opposite), a contemporary wagon porch and no exit opposite the entrance to the midstrey. In the foreground a sling-brace supporting the aisle purlin in the middle of a bay. In the background a passing brace from a wall-post to the tie-beam.